Ladies and gentlemen, you’re about to take a big step closer to realizing your dream of controlling everything around you with Alexa. Behold, the GE JES1097SMSS Smart Countertop Microwave Oven. It has all sorts of modern microwave technologies built in like GE’s awesome scan-to-cook tech, but it also has something even better: Alexa! 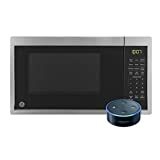 Just say something like “Alexa, microwave for five minutes” and your food will be piping hot in no time. $140 is more than reasonable for this hot new microwave, but it just got its first ever discount so you can snag one for $119. You can also get it bundled with an Echo Dot for $155.